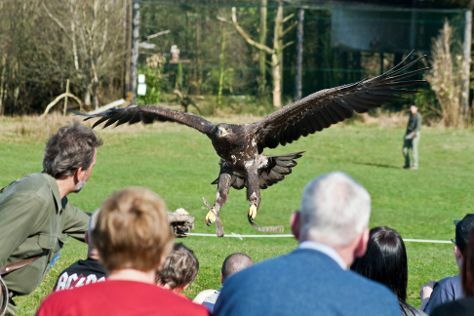 Eagles Flying has been added to your itinerary. On the 18th (Sat), see the interesting displays at National Museum of Ireland - Country Life, then see the interesting displays at Michael Davitt Museum, then contemplate in the serene atmosphere at National Shrine of Our Lady of Knock, and finally relax in the rural setting at Graune Pet Farm & Play Centre. Get ready for a full day of sightseeing on the next day: get a dose of the wild on a nature and wildlife tour, look for all kinds of wild species at Eagles Flying, stop by Lady's Buttery Craft and Art Gallery, take in the architecture and atmosphere at Royal Abbey of Cong, then step into the grandiose world of Ashford Castle, and finally appreciate the extensive heritage of The Cong Heritage Trail. For where to stay, more things to do, photos, and other tourist information, read our Cong itinerary planner. Galway to Cong is an approximately 1-hour car ride. You can also drive; or take a bus. Expect a daytime high around 19°C in August, and nighttime lows around 13°C. Finish your sightseeing early on the 19th (Sun) so you can drive to Galway. Kids will appreciate attractions like Aillwee Cave and Dunguaire Castle. Explore the numerous day-trip ideas around Galway: Bunratty Castle and Folk Park (in Bunratty), Burren Birds of Prey Centre (in Ballyvaughan) and Dolphin & Whale Watching (in Carrigaholt). The adventure continues: explore the striking landscape of Connemara National Park, stroll through Eyre Square, look for gifts at OMG @ Zhivago, and appreciate the extensive heritage of Salthill Promenade. To find more things to do, other places to visit, maps, and more tourist information, use the Galway trip itinerary planner. You can drive from Cong to Galway in an hour. Alternatively, you can drive; or take a bus. In August, plan for daily highs up to 22°C, and evening lows to 14°C. Wrap up your sightseeing on the 24th (Fri) early enough to travel back home.